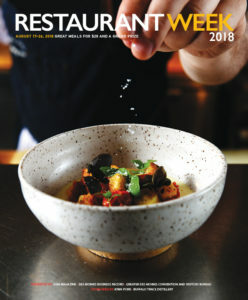 On the Cover: Chef Joe Tripp of Harbinger puts the finishing touches on burrata chawanmushi, which will be offered during Restaurant Week. To find out more about this delicious dish, click here. Anticipation will soon give way to excitement as Restaurant Week returns: Specialty meals and special deals at 36 great eateries. The bargain remains: $14 gets you one lunch and $28 gets you one three-course dinner. Some places offer both, some are just doing the lunch or dinner, but all are eager to serve you. And once again, it is so big that Restaurant Week can’t fit into a week—it’s 10 days of delicious, Aug. 17-26. And, once again, we’re sweetening the deal with a prize package. It’s easy: If your name is drawn, you’ll receive certificates to enjoy some of the best our town has to offer. See page 15 for details. To learn more, check the website DesMoinesRestaurantWeek.com and follow the fun on Facebook and Instagram (#dsmrw2018). We also have a handy app (search “dsm restaurant week”) and space in the Twittersphere (@DMRestaurantWk). Participating restaurants are profiled on the following pages; they’re also listed on the website, where their Restaurant Week menus will be added early in August. Alba was one of the first restaurants in town to put as much love into vegetables as they did meats, and the kitchen still does thoughtful work in that vein. Look for dashing ways with seafood, meats and pasta, always with some good produce in the mix: a white lasagna enriched with porcini jus and enlivened with kale and fennel, for instance, or a wine-braised brisket with carrot risotto and turmeric-pickled cauliflower. No matter how creative the cooking gets, what you’ll remember most is the genuine flavors of seasonally, locally sourced food. With windows framing the John and Mary Pappajohn Sculpture Park, this stylish, two-story restaurant occupies a historic former car dealership on Locust Street. Bright World War II-themed murals pay tribute to the midcentury cocktail generation, and the bar follows suit with handcrafted libations. The menu opens to American bar-grill favorites (steaks, burgers, shared plates and comforting entrees such as short rib pot pie and bacon-wrapped meatloaf); most dishes are tweaked with hallmarks of today’s polished-casual cuisine. To wit: a little truffle oil here, some aioli there—and plenty of bacon all around. Located in a cozy Sherman Hill Victorian house, Aposto is a top choice for a romantic dinner. Italian specialties anchor the menu, though influences from French and Latin cuisine also make their way onto the plate. During Restaurant Week, visit Aposto’s website to reserve a table for dinner; the restaurant is open Wednesdays through Saturdays. The website also has details about its monthly pop-up dinners, which are a great way to enjoy one-time-only creations from Chef Shawn Bennigsdorf and to sip on perfectly paired wines from owner Tony Lemmo’s cellar. Located in Capital Square downtown, Big City is a go-to spot for a casual and satisfying weekday lunch. Find a thoughtful array of well-composed salads and admirable burgers and sandwiches. While in burger mode, go all out with some Big City Fries—thin-cut fries tossed with asiago cheese, white truffle oil and parsley. If fresh and crunchy is more your style, dig into the greens side of the menu: Main-dish selections include a sesame-romaine salad and a poppy-seed dressed kale salad, gussied up with touches such as pecorino cheese, pistachios and dried fruit. During Restaurant Week, Big City will serve a lunch-only menu. Blaze is a California-based franchise that’s made its name on perfecting crisp-crust pizza made in a blazing-hot (600°F to 900°F) oven with lightning-fast speed (180 seconds). Other distinguishing qualities include made-from-scratch dough and fresh ingredients, from classic to less so. Also of note: Sauce choices go beyond traditional red or white, and include garlic pesto, barbecue drizzle, ranch, balsamic glaze and Buffalo sauce. P.S. : Because some like it thick, you can opt for a “high rise” version of the original thin crust. Blaze will offer its Restaurant Week menu during lunch. Bonefish Grill, a Florida-based restaurant business with more than 200 restaurants nationwide, lures diners in for market-fresh seafood cooked over wood-burning fire. Regulars on the menu include ahi tuna, Chilean sea bass, rainbow trout and salmon, served with a choice of sauce, such as lime tomato garlic, mango salsa, herb pesto, pan Asian and lemon butter. For a more casual bite, look for hand-helds or bowls, such as fish tacos or shrimp pad Thai. Also check out the website for specials, and note that the venue is now open for brunch on weekends. Christopher Diebel’s handsome downtown locale exudes grandeur, poise and polish; the lounge, especially, feels like a stylish update of the Southern parlor setting, replete with nailhead-trimmed upholstered dining chairs and 6-foot chandeliers framed by swag-draped windows. Take it all in while sipping clever craft cocktails. The bar specializes in well-curated bourbon and rye; or, try one of the thoughtful craft beers on tap. Buttermilk-fried chicken, barbecue meatloaf, and shrimp and grits are mainstays, and the Bubba burger, topped with pimento cheese and pecan-smoked bacon, makes a great any-night bite. In the early 2000s, Centro energized the downtown Des Moines dining scene with an urban-chic ambiance and grand-scale ambition. Its appeal endures: On any given night, the room swells with the animated buzz of a contented crowd. Some pile in for chef-restaurateur George Formaro and executive chef Derek Eidson’s satisfying and sincere takes on Italian-American food (Mama’s meatballs, onion rings, red-sauced cavatelli and the like). Others seek out the more swanky side of the menu, such as seared sea scallops with risotto. Beer lovers take note: Eidson, a craft brew enthusiast, rigorously purveys thoughtful, food-friendly selections. These days, you can find sports bars and fine-dining spots all over the place. What’s harder to hit upon is that sweet spot in between: a place you can go for that casual Tuesday-night meal that’s as thoughtfully prepared as a Saturday-night splurge. Chef’s Kitchen is exactly that. On red-letter days, try the steak de Burgo, shrimp scampi or bistecca alla Fiorentina (grilled steak finished in olive oil, garlic and herbs). For a more casual night, check out their extensive burger and sandwich options. Also note there’s never a corkage fee here. When it opened 25 years ago, Cosi Cucina blazed a trail locally when it fired up the area’s first wood-burning pizza oven. The eatery remains a go-to spot for cheerful service and carefully made Italian classics and house specialties. Many, such as the spaghetti and meatballs and the chicken parmesan, are anchored by Cosi’s signature robust red sauce flavored with locally made Graziano sausage. Cosi also takes first-course green salads seriously, with options such as spinach with candied almonds, sun-dried apricot, feta cheese and blackberry vinaigrette. Dave and Jean Thomson, the owners of Urbandale’s popular Urban Grill, opened this sister venue in 2016. Find polished bar-grill favorites, including many with alluring twists: Forget ho-hum chicken—how about a grilled breast, topped with sautéed Brussels sprouts, bacon, tomato and a Dijon hollandaise? The District Rib-Eye gets an update with Hawaiian marinade and spices, and a sliced presentation plus a peppercorn crust add a new angle to steak de Burgo. Find straight-up favorites, too, including chicken piccatta, simply grilled steaks and a Cobb salad. Enjoy it all in a handsome and spacious modern atmosphere, and take it outside on the patio when you can. A coffeehouse wishing to thrive in the crowded local field needs to do something to set itself apart. Mission accomplished at DSM Brew. In addition to serving top-notch coffee drinks, including nitro coffee (cold-brewed, nitrogen-infused coffee), it’s also a hot spot for cool gelato—they scoop up 16 colorful and intense flavors of the dense and creamy Italian ice cream. DSM Brew also serves beer, wine and a limited selection of cold sandwiches and grilled panini. In addition, look for brunch on Sundays as well as afternoon tea—complete with dainty sandwiches, scones and pastries—on Tuesdays (by reservation only). While the coffeehouse doesn’t usually serve dinner, it will offer both a lunch and dinner menu during Restaurant Week. In a restaurant that gleams with reclaimed barn wood and brims with a buzzy crowd, owner Jason Simon and chef Nic Gonwa bring grand-scale ambition to the casual dining scene. With nary a chicken Caesar salad in sight, the creative menu showcases flavors of the Mediterranean in general and spotlights Spain, Morocco, Egypt and Italy in particular. While selections change frequently, adventurers should try Gonwa’s takes on octopus and pork belly when they spot them; dishes like hangar steak and pork Bolognese lasagna—not to mention the wood-fired pizzas—are favorites of everyone. Look for fresh and homemade Mediterranean-focused fare at this family-run eatery located in the District at Prairie Trail, the growing shopping, dining and entertainment hub in Ankeny. The menu includes gyros, falafel and grilled chicken pitas; paninis; and salads. Also look for cheese, meat and Mediterranean platters—perfect for enjoying on the patio with friends and a glass of wine in summer. A good selection of vegetarian options is available, and smoothies and fresh-squeezed “green juices” (made with good-for-you fruits and veggies) are also a specialty. While a handful of seafood, pork and chicken entrees dot the menu here, it’s nearly impossible to pass up the steaks: lusty prime-grade beef, seared at 1,600 degrees and served on burn-your-fingers-hot plates. Equally irresistible are the indulgent sides, such as creamed spinach and jalapeño-sparked scalloped potatoes. Without exception, Fleming’s does wine right: Whether you want to splurge on a high-end bottle or go for something easier on the wallet, it’s nice to know that all wines are always served in peak condition at optimal temperatures. This snug spot in the Drake area is perfect for a casual lunch or pre-movie bite (it’s right next door to the Varsity Theatre). However, thanks to a pleasant dining room separate from the order-at-the-counter operation—and the recent additions of beer and wine to the menu—you could easily linger here a while. Find expertly seasoned falafel, chicken shawarma and gyros meat, and enjoy these Greek and Levantine specialties either tucked into pita or served over a salad. Also look for homemade soup; selections vary, but lentil and tomato-basil are favorites. For dessert, snag a square of nutty, flaky and irresistible baklava. 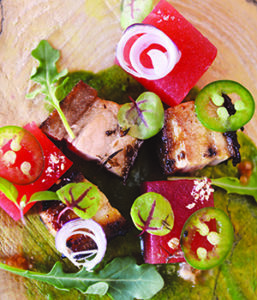 Chef Joe Tripp often imbues his vegetable-centric small-plates creations with flavors inspired by his repeated culinary journeys to Southeast Asia. Yet a New American sensibility flows abundantly through the menu, too. The ingredients—as locally purveyed as possible—come first, and seasonality stars on every plate. The rustic-chic ambiance, complete with reclaimed wood from a beloved local farm, underscores the restaurant’s true-to-Iowa ethos. 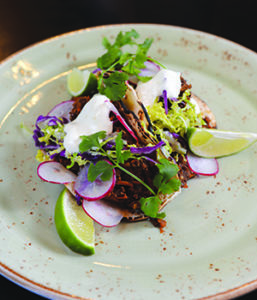 Click here to see one of the dishes he’s plating for Restaurant Week. 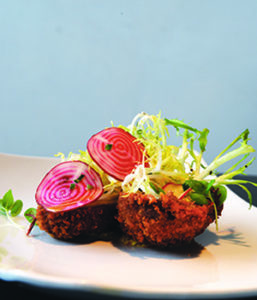 Suman and Cynthia Hoque’s airy and bright East Village bistro is a farm-to-fork leader. The menu, which changes often, prominently lists many of the farms and growers whose organic or chemical-free produce eventually makes its way to your plate. Proteins include grass-fed beef and lamb and pasture-raised chicken and duck, all raised without hormones, antibiotics, steroids or cages. This thoughtful bounty comes to the table in inventive yet approachable dishes—a recent menu, for instance, offered a meatloaf made with Tweed Croft Farm grass-fed beef, warm early spring vegetables, Maytag blue cheese salad, steak fries, chimichurri sauce and HoQ’s own steak sauce. During Restaurant Week, HoQ will offer only the dinner deal, although it will be open for lunch. Although this casual spot takes inspiration from modern mom-and-pop bistros all over France, the food is inspired by dishes from all over the world. Par exemple? A recent menu offered beer-braised steak tips with garlic mojo and salsa verde; a harissa and parmesan-crusted chicken dish; and baked cod with a Spanish parsley and almond sauce. In true bistro fashion, the restaurant also offers a thoughtful array of dinner-worthy omelets (e.g., a sweet potato, Brie and spinach omelet). Also note that chef-owner Tag Grandgeorge’s weekend brunches are a neighborhood favorite. While working in corporate sales a few years ago, Taufeek Shah opened a few jars of his mother’s hot sauce at a department potluck. The ensuing raves inspired him to commercially package Lola’s Fine Hot Sauce, which is now available in 1,200 retail stores and 500 restaurants across the United States and Canada. Following this success, Shah and his sister, Hannah Elliot, conspired to take the brand to the next level with Lola’s Fine Kitchen, a quick-service venue in Ankeny’s Prairie Trail District. While Lola’s had not yet opened at press time, the duo plans to serve Southeast Asian- and Filipino-inspired meals made with fresh ingredients and inspired by their mother’s scratch cooking. Don’t be fooled by the word “dive” in the name. Though a simple decor of soft banquette seating, handsome high-top tables, and scores of bottles on wine racks may attract a casual crowd, there’s nothing loosey-goosey about the wine and food here. Find over two dozen wines by the glass, including many off-the-beaten-path finds. When it’s time to eat, nibble through a tableful of thoughtful shared plates (e.g., pineapple-tuna nachos, ratatouille, grilled guacamole) or go the full dinner route, with choices like four-pork gnocchi or steamed mussels pappardelle. Be sure to enjoy the pleasant patio whenever you can. With the mantra “dedicated to the American farmer,” Machine Shed is appropriately housed in a structure near Living History Farms that recalls a barn. Generous portions and home-style cooking at breakfast, lunch and dinner are the restaurant’s hallmarks. Favorites such as the apple-whiskey-glazed stuffed Iowa chop, Haybaler top sirloin and classic fried chicken keep fans returning. And the award-winning cinnamon rolls with butter-cream frosting? Legendary. Located in the headquarters of the Des Moines Social Club, Malo is another see-and-be-seen venue in the George Formaro/Orchestrate Management empire. With pisco sours, mojitos and a daiquiri-style sip that pays homage to Hemingway’s time in Cuba, the thrilling drinks menu celebrates the cocktail culture of Latin America. The food menu features Mexican favorites, including tacos made from homemade tortillas and slow-braised meats, as well as generously portioned enchiladas, fajitas and Mexican sandwiches. Range shares a building with six golf simulators. With tufted leather chairs, cushy booths and numerous large, TVs, the pleasant dining room hovers on the dividing line between a super-casual country club and a high-end sports bar. The menu opens to an extensive selection of casual and contemporary bar-grill favorites (Buffalo wings, nachos, onion rings, flatbreads, steaks, chops, pasta, sandwiches, burgers and salads). Steaks can be ordered with signature preparations, such as pecan and pimiento chimichurri or a Wisconsin blue cheese crust. Veering well off the beaten path are big-game choices such as elk tenderloin medallions and bison steaks and burgers. Chef-owner Sean Wilson was deployed to Italy, Greece and Spain for 18 months while serving in the U.S. Coast Guard; later, he spent another year cooking in Spain and knocking around Morocco. These transformative sojourns inform his cooking through and through, including in his judicious use of spices. He roasts and mixes fresh spice blends weekly, then uses them in plates that reveal the ancient magic of spice in thoroughly modern ways. Located at the edge of Western Gateway Park, Proof also offers a captivating view of downtown Des Moines. For a peek at a dish chef Wilson will be serving during Restaurant Week, click here. Fine-tuned food in a hyper-relaxed atmosphere is now trending in the world, and chef Zach Gutweiler has nailed the formula. Expect a quirky ambiance (featuring taxidermy in the bar and some rotating local art in the dining room), and revel in the sometimes whimsical, always-elevated food. The menu changes often, but Gutweiler’s avant-garde approach remains constant. For a glimpse of this chef’s cheeky yet highly finessed style of cooking, click here. Des Moines neighborhoods and landmarks (the Teachout, for instance, brings Four Roses bourbon, lemon juice, simple syrup, chocolate bitters and zinfandel). Linger into the evening with a snack (deviled eggs, hot nuts), or thoughtful small and shared plates that can add up to a meal (avocado fries, baked Brie, flatbreads). For a lunchtime visit, look for a limited but colorful collection of salads, soups and flatbreads. Brunch is served Saturdays and Sundays. Executive chef Aaron Holt crosses hearty foods with flavor-charged touches for his menu of shared plates (pork belly tacos with daikon slaw, crab croquettes with red pepper remoulade), flatbreads (four-cheese pasta; spinach and artichoke), charcuterie boards, sliders (root beer-braised pork; crab cakes) and a handful of large plates (e.g., seared scallop risotto, beef tenderloin with brandy cream sauce). The precise craft cocktails are another reason not to miss this Court Avenue favorite. This is the city’s premier spot for high-end seafood. The fish and shellfish are jet-fresh, of course, but the real pleasures lie in the way chef Dominic Iannarelli and team get these delights to the table just-from-the-heat hot, yet glistening with a sparkle of the sea. Sriracha scallops and sea bass meunière are signature plates, but even the more humbly priced miso salmon transcends the ordinary. For more casual nights, duck into the raw oyster bar and enjoy well-purveyed oysters from the Pacific Northwest and New England and enticing appetizers, such as grilled octopus with chipotle romesco and potato puree. Surprisingly few places in Des Moines offer a full bar, an extensive kitchen and bakery, dedicated table service and expert espresso drinks together under one roof. This place does it all in the pleasing midcentury-modern setting of a recently rehabbed furniture warehouse. Look for healthy, fresh and up-to-date food at breakfast, lunch and dinner. Toasts—quality toasted bread topped with enticing ingredients, such as mixed mushrooms with truffle queso—are a specialty here. 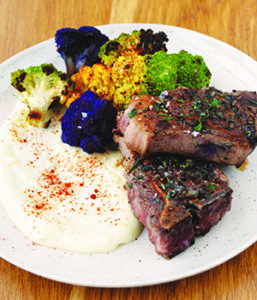 Lamb lovers will want to check out one of their Restaurant Week offerings, click here. Having grown up on an Illinois farm, chef Lynn Pritchard’s passion for farm-inspired food runs deep. At Table 128, he brings the fresh-and-local ethos to the table with the precision and refinement of a classically trained chef. While he rotates new dishes onto the menu often, his beet salad, angry doughnuts and Brussels sprouts salad are sought-after mainstays. Meanwhile, his wife and business partner, Sarah Pritchard, oversees the expert front-of-the-house staff and curates the venue’s extensive wine program, featuring more than 125 bottles from small, artisanal producers worldwide. 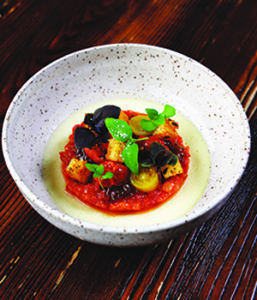 Currently, chef Pritchard is steering his menu in more vegetable-centric ways. As an example, click here to see what he’s cooking up for Restaurant Week. Chef Lisa LaValle describes her cooking as “locally sourced and plant-inspired,” and indeed, grains, legumes and veggies grace the menu in dishes such as creamy asparagus-saffron pasta or a Kyoto salad with wild black rice and vegetables. But meaty entrees—such as a Berkwood Farms sausage ragu-topped pasta—keep carnivores plenty satisfied, too. The lunch-only venue is located within the Greater Des Moines Botanical Garden. If it’s a patio-perfect day, sit outside on the terrace, which overlooks the water garden, complete with lily ponds and a panorama of downtown Des Moines. Once known primarily as a small-plates emporium, Trostel’s Dish now serves a full menu of familiar-yet-finespun contemporary favorites, on both large plates and small. You can still make a meal out of a table full of appetizers such as the Boursin mushrooms, crab cakes, havarti shrimp, bruschetta and calamari. Or, keep it casual with beef and Boursin sliders, cracker-crust pizza or shrimp tacos. Those looking for a traditional full-scale dining experience will be glad to spot some main-dish-sized sandwiches, salads and entrees on the menu, including prime rib, cedar-planked salmon and Trostel’s famed gunpowder rib-eye. When it opened in 1987, Trostel’s Greenbriar was mostly a special-occasion, white-tablecloth venue. Certainly, you can still head here for fine-dining classics such as prime rib, beef tenderloin Oscar and chicken piccata. However, today’s vibe and decor swing more good-natured than formal, and there’s plenty on the menu that follows suit, including pizzas, burgers and sliders. Take a look at chef Troy Trostel’s seasonal specials; for example, a recent menu featured grilled spring lamb chops partnered with spring pea risotto for a seasonal, chef-driven dish. Divvied up into snug rooms that are tastefully lit and filled with handsome mahogany furnishings, Urban Grill is an inviting spot to enjoy contemporary American favorites. The wide-ranging menu brims with entree salads, pasta, seafood, burgers and sandwiches; options range from ever-popular standbys, such as French dips, cavatelli and chicken Marsala, to lesser-known choices such as pretzel-crusted grouper and smoked chicken linguini in jalapeño cream sauce. Service matters here: The owners of this family-run venue take pride in ensuring that family members are on staff every day to keep standards high. With its red-brick walls as a major design element, this smart wine bar taps into the historic appeal of its Valley Junction environs while also conjuring up a cozy wine-cellar vibe. Choose from 28 wines by the glass and even more by the bottle, as well as beer and espresso drinks. To eat, the shared plates—including nuts, olives, hummus, and meat and cheese boards—make this a good spot to head with friends to ease out of the workday and into the evening. For lunch or a casual dinner, enjoy well-composed salads and sandwiches. Also head here for a late-afternoon or after-dinner indulgence—desserts, including cheesecakes and mini cakes, beckon from the glass display case.